A recent study by the Dorothy A. Johnson Center for Philanthropy and 21/64, a nonprofit consulting practice, dives into the giving interests and preferences of young major donors. The report, available at NextGenDonors.org, provides useful insights into how young, highly engaged activists and donors view their relationship with charities and social change campaigns. 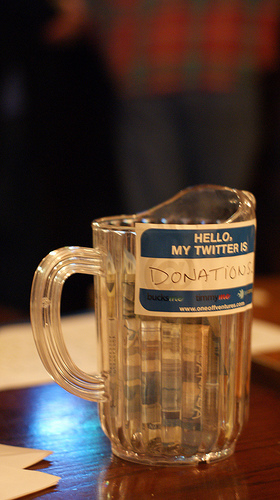 Modern fundraising integrates online and in-person approaches. Photo via Flickr user jaymiek. This study has been making the rounds. It has been covered recently by The Chronicle of Philanthropy, was introduced by its authors in Stanford Social Innovation Review, and moved Jeff Brooks to provide a valuable critique that we’ll get into shortly. What’s important about the opinions of a few hundred wealthy young donors? It’s well known in philanthropic circles that the transition of wealth from baby boomers to younger generations is coming – it has in fact begun – and will pass trillions of dollars to donors that have come of age in a world where the Internet has radically changed both communications and donor-organization relationships. Basically, these are important nonprofit supporters today but in years to come this cohort will be found on nonprofit boards and in other leadership positions. Their attitudes towards giving and programming will help shape nonprofit budgets, staffing, and more. What’s less clear, of course, is how transferable the experience and opinions of a small set of young donors is to a larger populace that will (one hopes) become tomorrow’s nonprofit donors, members, activists and volunteers. We can, though, highlight some key takeaways from this survey that coincide with our own experience working in and around nonprofits in recent years. The nature people’s relationship with nonprofit organizations is constantly evolving. This is true on an individual level – most people are more engaged in their community as they get older, have kids, stay in one place for a while, and have more disposable income – and at a broader scale. The Internet has changed communications, hastening a shift in expectations people have about information sources, interaction with government and community groups, and the availability of performance or result-driven data. People want to make a visible impact. Quickly. This is a tough one for many groups and the fact is that behavioral, political and social changes don’t happen fast. This makes it hard to keep activists and donors engaged over time and perhaps plays a role in falling donor retention rates. What can be done? It is important that organizations present tangible goals when talking about their work instead of relying solely on general “change” and “making things better” messages. Documenting performance with photos, video, text and more is also critical. Report back on your work in a timely way. Help activists and donors draw a direct line between their support and results. People increasingly expect transparency. An annual report no longer qualifies as transparency. Today, people can look up the 990 of any American nonprofit in just a few minutes. A quick spin around Google will bring the curious a wealth of viewpoints on any topic, including the opinions and work of organizations that may disagree with yours or who might be seen as competitors. Your organization no longer owns communications about your topic – nor do people expect it to. What can done? Open up. Putting more financial info online (and telling people about it) is a start. People will find it all, anyway, so why make it hard. Within the limits of operating policy, be open about your donors, what they’re funding, and how staff are making programmatic decisions. Seek out ways to engage activists and donors in the agenda-setting process. Transparency is not just about what you did in the past but also about how you choose your organization’s actions in the future. It won’t be all wine and roses. A clear view in exposes the warts as well as the flowers. But people – especially those that you ask to invest time and money – expect to see inside because the systems are there today to make it possible. There is move towards people more directly engaging in the change they are supporting. That can mean that donations are seen as investments and activism as something that happens in person or at least elicits a measurable result. Organizations can and should look for ways to interact with donors and activists. As mentioned previously, report back constantly, not just annually. Use social media and email as channels for interactive engagement and soliciting ideas, not just as broadcast platforms. Explore and test crowdfunding and project-related investments. The lesson here is not to radically change your fundraising course. After all, you have (one hopes) many strong and supportive donors comfortable with your organization’s approach to fundraising and programming. But you also need to really listen to your donors (and people that you expect to be your donors) to better understand their interests, what engages them, and why they give. This is not the time to kill your individual donor program and start a Kickstarter-inspired crowd-funding program. But be willing to test some new approaches – giving them the attention, resources, and time needed to grow. Recognize that people – whether in their 20s and 30s or 50s and 60s – want to make their community, country and world better. The first step is to ask. But know that today there are more people asking in more ways than ever before so it helps to offer up ways to become personally engaged and invested in tangible outcomes. It is easy for people to walk away from a $30 annual contribution to a group they know only through email fundraising asks. The hunt for young donors and supporters is an important one for most organizations. We don’t advise any group change course based on this report but believe it offers useful insights into how people are shifting their relationship to changemaking.